People… up on the Kings Canyon Rim Walk, were leaning out over the edge admiring the view or snapping a photie of the stunning red rugged cliff face, which from my vantage point, down here on the canyon-floor required no such antics! I’ve enlarged them for you in the picture above on the left, which is clipped from the top left of the right hand photo… that gives a sense of scale! 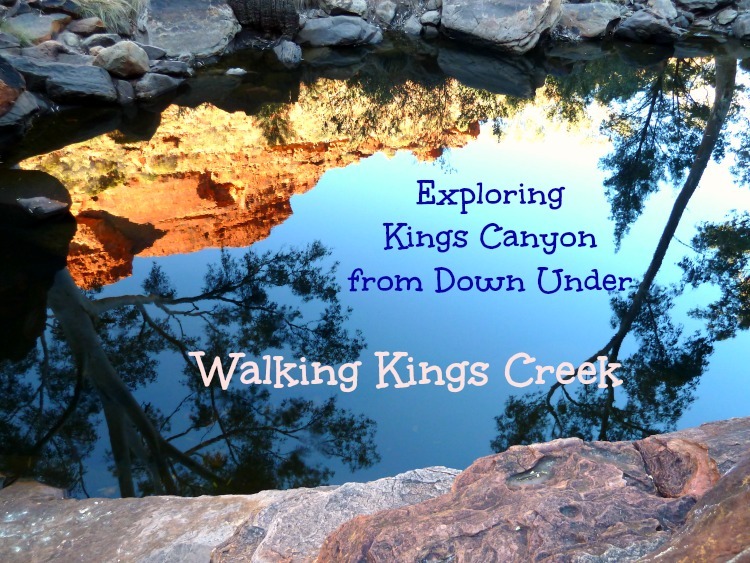 This was our second day visiting Kings Canyon in Watarrka National Park. 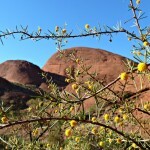 Watarrka (pron Wah-tah-kah), named in 1989 is the local Luritja people’s name for the Umbrella bush (Acacia ligilata), which is a common plant on the sand plains in the region. Assuming bigger must be best, meaning a 6km (3.75 miles) challenging Rim walk must be better than an easy 2km (1.25 miles) Creek stroll, we’d tackled the 500 (or so) steps taking us up and around the Kings Canyon Rim Walk (click the link for the full story!) on our first day, so we’d already circumnavigated the canyon around the top getting some bird’s eye views of the sheer sides that appeared to be oh-so crisply cut right down to the canyon floor, where the Kings Creek Walk that we were doing today meandered. 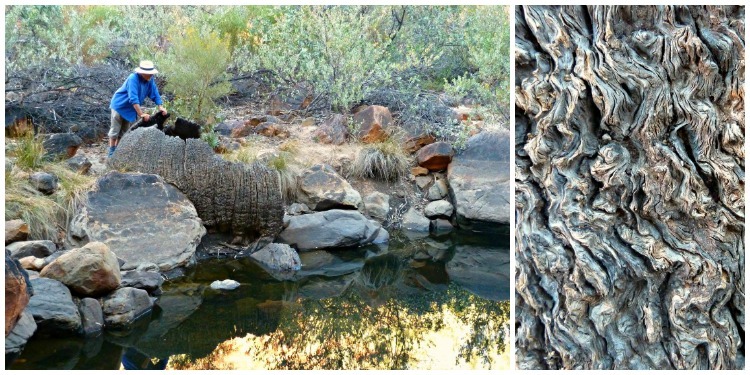 Down here on the creek bed, it was a very different place to the harsh environment up on the rim where the sun not only beats down from overhead, but also rebounds back up from the barren red hot rock underfoot. Down here is where the Luritja people would have lived. Sheltered from the extremes of the weather. – and I don’t mean those of tourists! 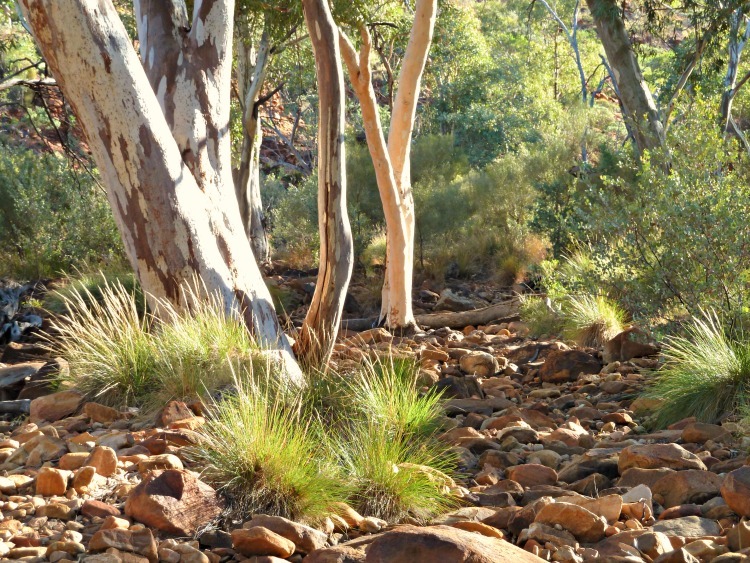 The River Red Gum known as Itara (pron I-tar-ah) in the local Luritja tongue were an important food source. 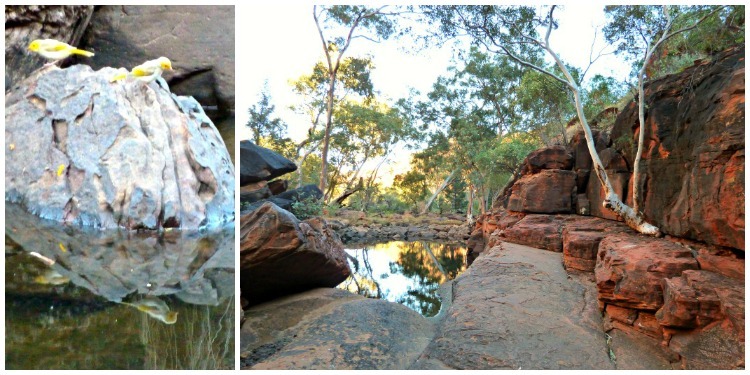 Ngapari (pron nah-pah-ri), a white sugary scale that forms on the River Red Gum leaves was collected by the women as they shook the branches making bits of the sweet crust fall either into a receptacle or onto a flat rock below, where it was swept together with a small branch and packed into a ball for sharing. Then, there are the big white grubs – maku (pron mah-koo), which live at the bottom of long tubes leading from the surface down to the roots of the River Red Gums when they’ve been exposed by flood-waters. The women put a long piece of hooked grass down these tubes and would pull the grub out quickly to then cook on hot coals. 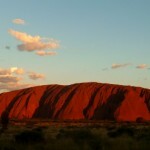 Aboriginals appreciate their precious landscapes. They look up to and bestow a healthy respect to the land-forms that support them. And as the canyon walls rose up to encompass and embrace us it also signaled that we were reaching the end of our permitted trail. 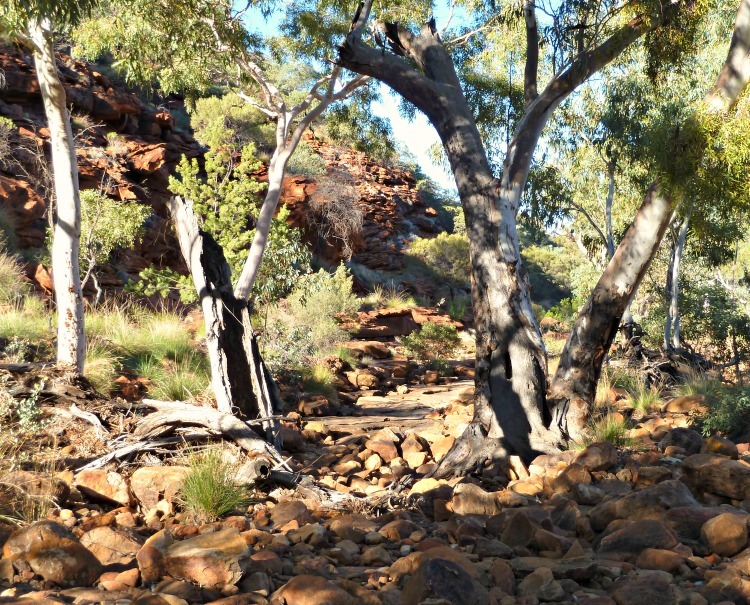 In these lower reaches aboriginal families would have camped together – But the women and children, like us visitors, would not venture further into the canyon’s inner secret folds. Beyond this point lies a hidden world where mens’ private ceremonies were performed. It was here, at our turning point, that we came upon a side channel of water remaining in this otherwise dry creek. As we stood beside this pool there was a sense of sanctuary and oneness with nature when a pair of yellow and white birds came in to drink – sharing this life giving resource. And there was evidence of years of previous occupation at the edge of the pool – small wells for storing water, which covered with a rock would have preserved this liquid gold from evaporation so when the main pool finally disappeared leaving exposed dry rock, a final vestige would be saved for survival. Also of interest on the far side was the remains of a huge woody plant base – that looked ancient. But no matter what it was – “that thing belongs here“. And as we prepared to leave this special place, I caught sight of this stunning reflection of the canyon walls in this precious pool of liquid life. offered two very different perspectives. 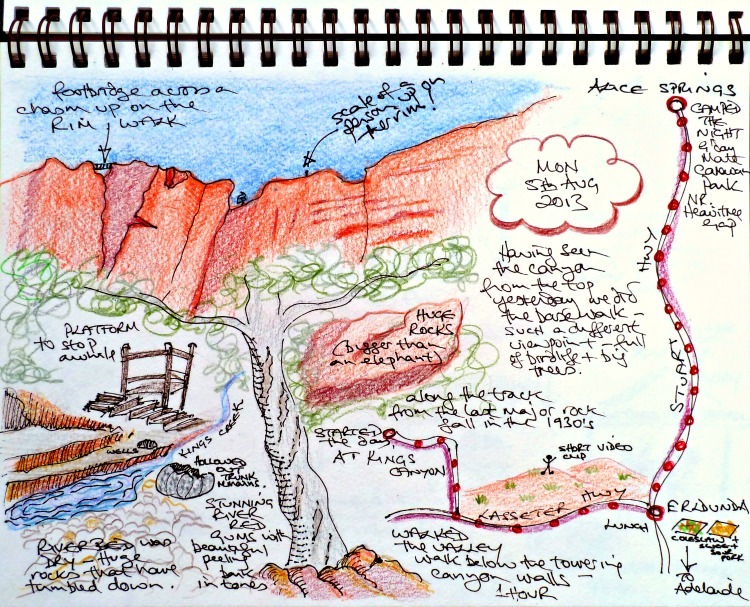 This entry was posted in Australia - The Red Centre, Wonderful Walks and tagged kings canyon, uluru, walk, watarrka by Linda. Bookmark the permalink. Hi Linda: What a lovely blog you have! I like the inclusion of maps in the posts. Quite the vertical drop in the canyon you have featured. 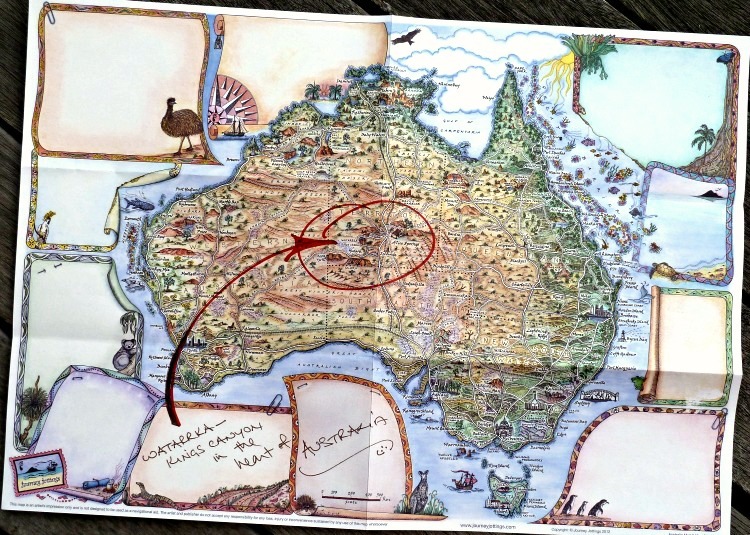 I’ve not yet been to Australia, but it’s definitely on my radar for the 3rd volume of Chocolatour. Welcome to my blog Doreen! 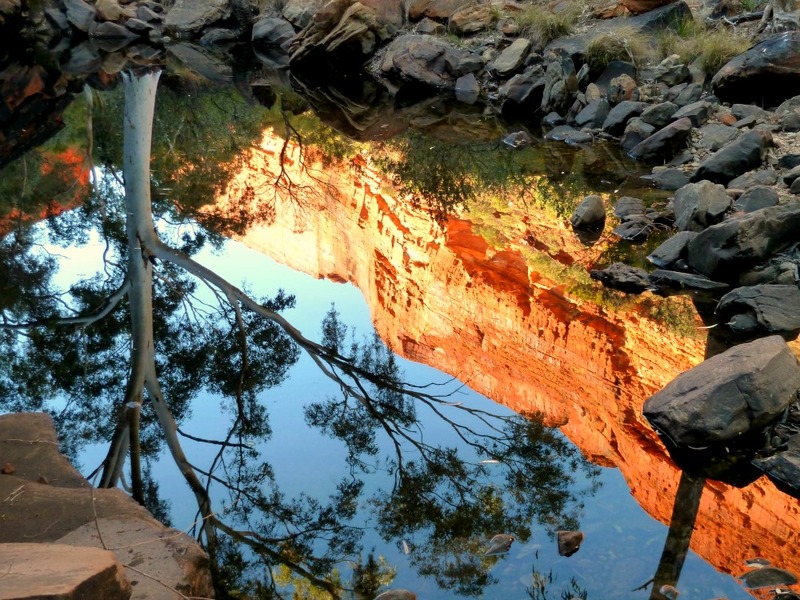 Linda, thanks for sharing your amazing visit to Kings Canyon. 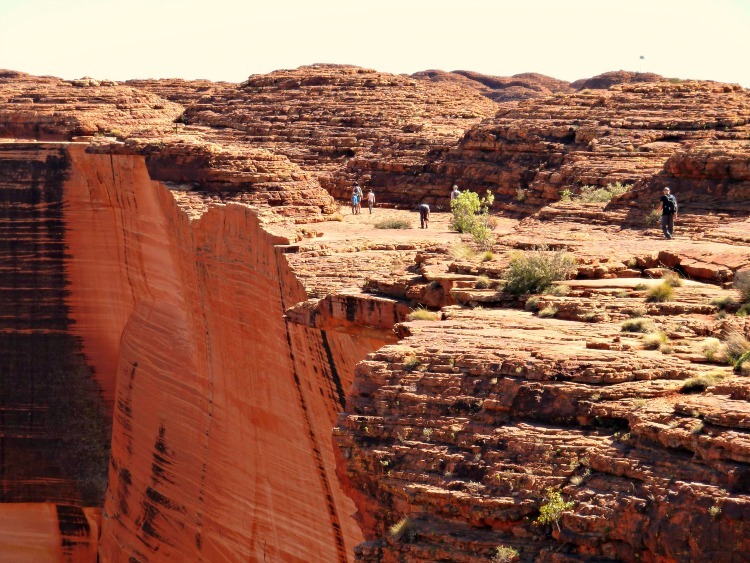 I have high hopes of visiting Central Australia in the not too distant future and Kings Canyon is definitely on my list of places to visit. Your photos and stories are very inspirational. Lovely follow up to your walking the rim post. It’s not often the 2 perspectives are so readily available and that you can feel the presence of those who lived there before. If you find out more about the bowl, please do let us know. 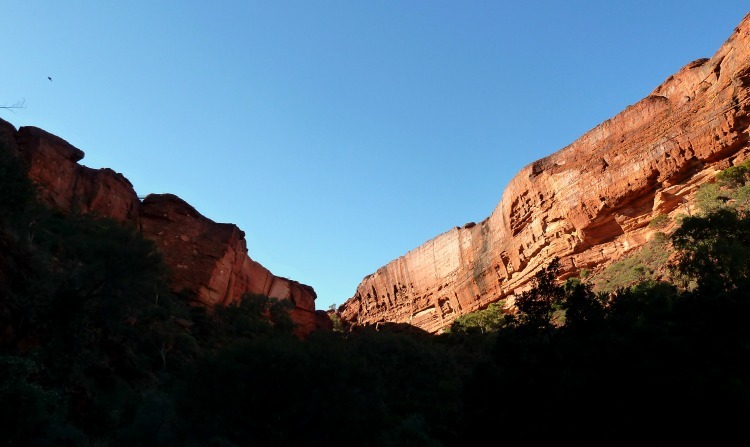 Many people who therefore do the Rim Walk leave assuming Kings Canyon has been conquered! Such dramatic scenery; your photos really capture it! The Red Centre is a photographers dream Marilyn! I’ve certainly enjoyed your posts on Kings Canyon. Both walks look fabulous and I agree, I think you would have to do both to really appreciate it. The scenery on the lower walk is beautiful! Those shear canyon walls are just amazing. This looks like a fabulous walk though Kings Creek full of beauty and a sense of time gone by. Interesting background about the Luritja people that lived there. So sad reading this that I didn’t have time to do the short walk when I was there. That reflection pool photo is stunning. Your photos are stunning, especially the one with the reflection in the water. 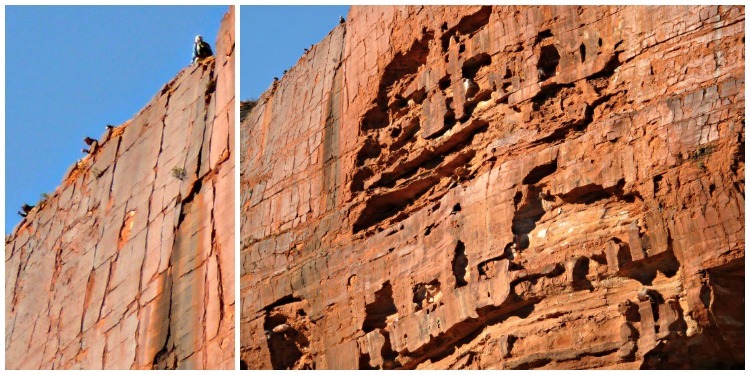 I also love the perspective of the hikers seemingly on the canyon’s edge. Of course your story map is a work of art, just beautiful and full of bite sized pieces of information that as travellers it’s easy to neglect or forget. Hence our dotted route from the Canyon on the right side of the Story Map. What a wonderful post, it’s one thing to walk the Rim but to see it from below, simply beautiful. But yes – seeing the Canyon from both the top and the bottom was great to get both perspectives!